The following two articles (this one and the next one) are only a few of the many DNA Project success stories for those of Irish heritage. Success is often relevant to the tester and gaining any information or clues is a great relief when you are at a brick wall. These stories show a varying degree of success as more genealogy work is needed to find that common ancestor. Often, however, to find a location in Ireland for that search is a major break though that DNA testing can provide. My journey for my Irish roots began in my late teens, after my grandfather died. He was a man who I know had many of the answers to the questions I now have, however I was never interested enough to ask them while he was still alive. Terrence Tally, my namesake, was named after his father, Terrence John Tally, who sailed with his brother Peter from Belfast to New York City in 1856, finally settling and becoming the Sheriff of Virginia City, Nevada, the colorful, exciting and robust gold rush town of the American west. I started asking my dad and grandmother questions about Terrence John, knowing only that he came from Ireland. All my grandmother knew about her father-in-law, who she never met, was that he came from County Tyrone in Northern Ireland. My dad knew no more. I started contacting distant cousins of mine, descendants of Terrence John, to see if they had any information either: specifically what town or village in Country Tyrone he was from, any information about his siblings, what his parents names were, etc. Other than some interesting stories of the Wild West and his position as Chief-of-Police in Virginia City and a few anecdotal recollections here and there, there was little light shed on Terrence John Tally. I continued my quest, but usually came up empty handed. In the summer of 1981, while on business in New York City, I visited the genealogy section in the New York City Library. In my limited research that one morning I discovered several mentions of the name Tally in a few towns and villages in County Tyrone. Here, for the first time was a solid link to my past! Rather than do the sensible thing, looking them up and simply calling them, I took a cab to JFK airport and hopped on the first plane to Ireland. After landing at Shannon Airport in County Clair, I took trains to Belfast, rented a car, and braved driving on the left side of the road to Country Tyrone. While on this adventure I was stopped a couple of times by armed British soldiers asking for my passport, the purpose of my visit and what my destination was. This was in June1981 … during the heart of the Bobby Sands hunger strike when Catholic and Protestant turmoil was fierce and tourists were indeed rare. One quaint village after another and several wonderful people led to my meeting a sweet elderly lady who told me of Tally’s Bar in Galbally, a small village not far from the town of Dungannon. Finding Galbally and Tally’s Bar was easy enough. I asked around and was introduced to a very fine man named Patrick Tally. Was he the long missing link I had traveled so far to meet? 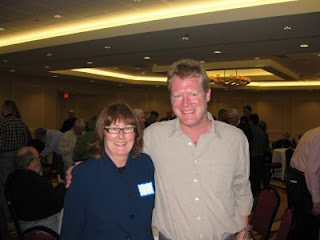 I told him I was a Tally from America hoping to find my great-grandfathers roots and wondered if they might have any genealogical information about the Tallys they could share. After some cautious questioning and uncertainty he decided I was for real and welcomed me into his home where I met his wonderful wife and five children. I soon met several other Tallys and was treated like a celebrity, especially, when the children from the area found out that I was employed in the film industry and had worked with Linda Carter, aka “Wonder Woman”, a very popular show at that time on Irish television. One evening when many of the neighbors from Galbally came to meet me and “hear my accent”, the children all stood in line for my autograph because of my “Wonder Woman” connection. 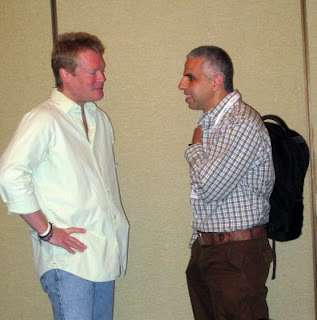 I, of course, happily obliged … you never know when you’re going to get asked for your autograph again. Everyone treated me wonderfully, and I felt like a long distant cousin regardless of our bloodline. While they had limited written family history documentation, I knew I was not far from my genealogical ground zero. Across the street from the Tally Bar and home was a cemetery with two tombstones with my first and last name on them. Unfortunately, these distant and long forgotten relatives that I had a thousand questions for brought me no closer to discovering my missing link. The genealogy material that Patrick Tally provided and the people we queried still failed to fill in the blanks. I left Ireland a more complete soul but with no definite new leads to my lineage. 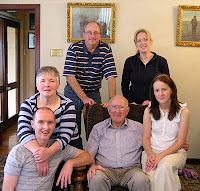 Many years passed with The California Tallys and the Galbally Tallys always staying in touch. We were visited on a couple of occasions by 2 of the daughters of Patrick’s while here on vacation. When I first met them in 1981 they were just little kids and my visit was one more story they heard about me rather than an actual memory. Finally in the summer of 2008, I decided to take my wife and daughter to Galbally and revisit the Tallys. Again, we were treated like royalty. The years, however, have still failed to provide us with any new information that positively defined our relationship. A few years ago, I heard about Emily Aulicino’s DNA projects and research and decided to take the DNA test to see what might transpire. I found the entire process fascinating and since I had still never determined that I was indeed in the same family tree as the Galbally Tally’s I proposed the idea of DNA testing to Patrick Tally’s only son, Patrick Jr. Sure enough he was open to the idea and did the test. We recently found a 37 marker match! Although we may never know our common Irish male ancestor, this has been a remarkable and wonderful tool. It confirmed my family history theory and filled in another blank in the search for my ancestors. I would certainly recommend this project to those who have embarked on a similar genealogical journey. A condensed version of this success story appears in Irish Roots Magazine, 2009 Fourth Quarter, Issue 72, page 20. 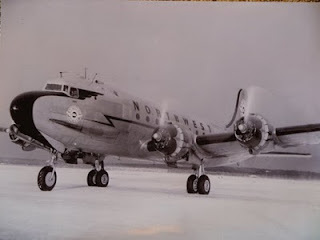 In 1948 Northwest Flight 4422 crashed in the remote mountains of Alaska. In 1997 the wreckage was found and two years later, a frozen human arm was discovered. Through the use of written documentation, fingerprints, and DNA, the arm was identified out of the thirty sailors on the flight using mitochondrial DNA which is found in every person’s DNA given to them by their mother. Hence, an international investigation began in 2007 by Dr. Colleen Fitzpatrick to trace each of the thirty sailors though their female lines to find someone whose DNA would match that of the arm and thus identify the victim. She was able to locate Mr. Conway of Limerick whose mitochondrial DNA matched sailor Frances Joseph Van Zandt. A shorten version of this story can be found in Irish Roots magazine, 2009, Fourth Quarter, Issue 72, page 20. Interested in doing a DNA test? Before ordering a test, understand what DNA testing can and cannot do for you. The following resources are easily accessible and are designed for the beginner in mind. Start reading at the beginning of the archives. This blog is designed for the beginner. Follow these easy steps to choosing the correct test. 1. Determine your goals. Are you just curious or are you testing for genealogical purposes? If you are only curious about your most ancient ancestry, order the cheapest test. If you plan to use the results for your genealogy, then order a 37 marker for Ydna and at least the HVR2 for mtDNA. 2. If you are a male you can test both your Y-chromosome dna (the top line; that is, the all male line of your pedigree chart if you are number one on that chart) and your mitochondrial dna (the bottom line or all female line of your pedigree chart). If you are a female you can only test your mitochondrial dna. 3. Matches when testing the Ydna are closer in time. By testing 37 markers, two people who match have a high probability of a common ancestor within the last 300 yrs. However, matches on the mitochondrial dna (mtDNA) can be up to thousands of years ago. Irish Roots magazine is a must for those interested in Irish genealogy. What pleases me the most about it is that the term Irish Diaspora is commonly found among its pages. This is significant to the vast number of genealogists who claim Irish heritage and who are seeking to find their origins in Ireland. I am constantly impressed by the Ireland’s genuine interest in those who left Ireland over the centuries. 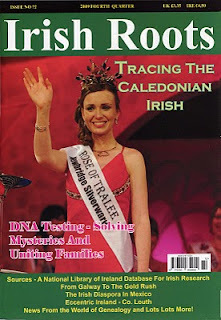 This recent publication features some wonderful articles including Tracing The Caledonia Irish, Irish Diaspora in Mexico, Clans of Ireland, and, of course the inclusion of genetic genealogy. DNA Testing - Solving Mysteries and Uniting Families was submitted by me, but those whose mysteries were aided by genetic testing actually did the writing while I organized and edited it. For this reason, I take no credit. My pride, however, is that the wonderful editors at Irish Roots asked me to do a DNA piece as they see value and interest in the topic. My hope is that articles such as this will inspire the Irish everywhere to test so they may learn where their cousins are and to locate their origins. As each story was reduced to fit the magazine’s space, I will post them as originally written along with the related photos. Each one is unique, and each is considered a success of DNA testing by the participants. You can find the Irish Roots magazine at some Barnes and Noble bookstores in the US, and this issue is on sale now. Family Tree DNA just sent the following reminder for their Holiday Sale which ends December 31st. However, they also mentioned new price reductions! These are fantastic savings from the original prices...or from the prices just a year ago. Take advantage of this wonderful offer. 2009 is coming to a close and we're finishing it off with an end-of-the-year promotion! First, though, let me thank you for helping us make our recent Full Mitochondria Sequence sale a resounding success. Despite the challenging economy this was the most successful promotion in our company’s history. Our Holiday Season promotion will bring back the discount that we offered this summer for the Y-DNA37, since this has been requested by many of our project administrators. Orders for the above tests need to be placed and paid for by December 31, 2009 to receive the sale price. IMPORTANT: since this promotion will run through the months of November and December, we encourage you to spread the word starting now, as the natural tendency is for people to order at the last minute, and we will not extend it beyond 12/31/2009. You may use our bulk email feature to notify existing project members about this holiday sale. Thank you for your continued support. We appreciate your contribution to the sustained growth of the Family Tree DNA matching database, the best genealogical matching tool of its kind. © All Contents Copyright 2001-2009 Genealogy by Genetics, Ltd. The new rage in DNA testing is with 23andMe. They test autosomal markers for ancestry and health purposes. 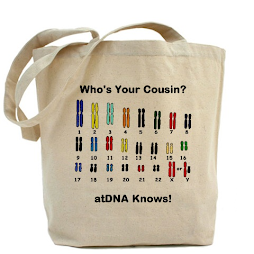 This means for your genealogy you can now match testers who are not on just your Ydna or your mtDNA lines. You can match people who are anywhere in your pedigree charts. This last October I ordered their Complete Edition which includes data for my health and for my ancestry. You can order these separately, getting only the Ancestry test, if you wish. This story, however, is about my genealogy. With 23andMe, at the moment, testers need to "opt in" to communicate with other testers. Under their section Relative Finder, I see that I have 239 people who match me. However, only twenty-one of them have allowed communication with testers. Of those twenty-one, only eleven have actually made contact. I am waiting for the other ten to open their email and reply to my invitation to share, one way or another: Accept or Ignore. The company lists the Predicted Relationship which can range from very closely related to distant cousin. I happen to have one 3rd cousin who, unfortunately, has not opted to converse with anyone as yet. Most others are 4th and 5th cousins. I have two listed as Distant Cousins. The probable rankings for cousins are given in a Relationship Range from 3rd cousin to 7th, 8th, 10th, etc., depending. Columns also give you the % of DNA Shared and the # of Shared Segments. Of course, the higher the numbers for these two, the better. 23andMe only deals with matching information within certain parameters, so other people could match you that are not listed. It is understandable that they want to provide matches that are reasonable. Also, remember that this isn't a full genome test. It only covers a bit over a half million markers. More people could match you if all areas were tested, but most of us cannot afford that. Lynleigh was listed as my 4th cousin with a relationship range from 3rd to 7th cousin. We shared .23% of our DNA. While that does not sound like much, you must consider that it is enough to determine relationships as the comparison is based on having a block of result which matches. We match on one DNA segment, Chromosome 20. This match can be seen under the link Family Inheritance. Here you compare your genome result with that of another person. A blue section appears where the match is. Both Lynleigh and I share the same haplogroup: U5a1. However, in this testing, unlike mtDNA (mitochondrial DNA), that is not important. The mtDNA test deals with the all female line (bottom line of a pedigree chart for the person who is number one on the chart). This is not where we match. On November 12th, I sent her a message stating that 23andMe found we are related. After she accepted my invitation to connect, I sent her a list of surnames for my 4th great-grandparents on both sides of my family also including the states that were relevant for each. I then refined it to add my direct ancestors' full names, a date, and the county for each state, hoping that a county would help narrow the search. ... Eads is connected to my Simpson line. ... Bowling to the Talley line. ... Roberson could be Robertson. ... Stokes were near Stokers in Southside VA and NC. ... Powell is connected to Talley. ... Rodgers could be Rogers. ... Shelton is connected to Doolin. ... Simms connected to Canterbury. "Maybe we should share more detail on some lines. For example where were your Eads in VA ... and your Jenkins in PA? Although Jenkins is a Welsh name, it does not mean we can connect them even if they are neighborhood due to the naming patterns. Mine were in PA in the late 1600s...some may have stuck around. I think that some of the Watson line (from Albemarle Co, VA) did land in NC or SC, but they are not in my direct line. SO ... some of these may be worth checking, especially if you and I have sibling info. This will surely teach people not to do just their direct lines!" On November 13th, Lynleigh asked to Genome Share. This can be done on a Basic or Extended level. The Basic level allows you to see which chromosome is matching. The Extended level allows you to share health information. We decided to do the Basic Sharing, and we learned that the matching result is on Chromosome 20. November 28th, Lynleigh found our common ancestor! Actually, her husband Yasuyuki does the genealogy and found it. Since I had only sent my 4th great-grandparents, her husband had to do my genealogy to be certain. Without a dedicated researcher, we may still be searching. Sending more information would have helped more easily. 23andMe predicted we are 3rd to 7th cousins, so they are pretty accurate. Not only do I have a new cousin, I have a research partner! In 23andMe results, you should consider all aspects of your genealogy. You must realize that any connection may be (and is more likely to be) through a line that crosses gender and/or from lines that branch off from any of your ancestor's siblings. 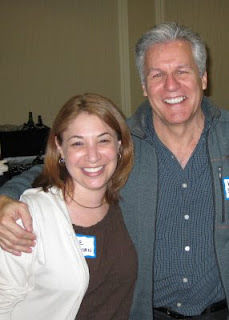 As you can see from my connection with Lynleigh, each of us crosses gender in almost every generation. It is VERY important that everyone decides to correspond even if you are a novice at genealogy or DNA. 2. Research all aspects of your lineage, including the siblings of your direct ancestors and some of their descendants. I have always had the general rule of researching three generations either side of my direct line. You could connect anywhere along the lines and more likely along lines that branch off of your ancestor's siblings. All those descendants are important to finding the connection. ... a. Names, dates, and locations of all your direct ancestors and all their spouses. ... b. Surnames of all the children's spouses. ... c. If any of your lines have tested for DNA with other companies, refer to that project link. ... d. If you have found connections on lines through 23andMe, mention where those are in your lineage. 4. Write some details of your lineage in the Invitation. If you have set up a website, include the link. 5. Share as much detail as possible about your family either through your website or in a Word Document that you can copy and paste to the 23andMe messages you write to your cousins. At some point, everyone will be comfortable sharing personal emails. 6. Start searching and researching. DO NOT give up. The common ancestor is there! If you have any DNA success stories, email me so I can post them here. Perhaps another cousin is reading this blog! 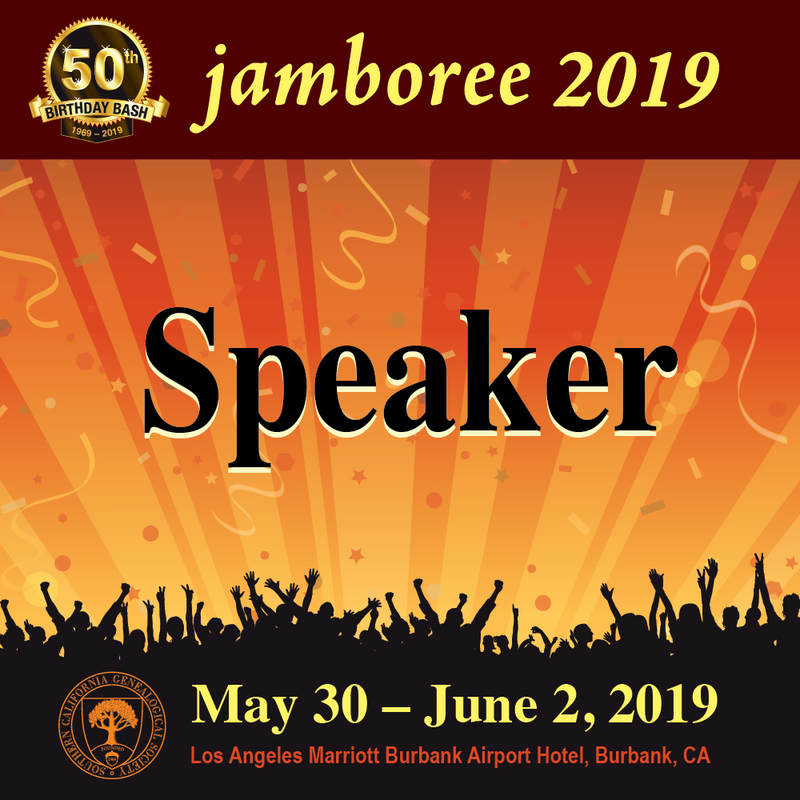 I'm excited to mention that Family Tree DNA has reduced the upgrades for the mtDNA (mitochondrial DNA) until October 30th, 2009. In the month of November they will be announcing a price reduction for new testers who order the mtDNA. This one is for anyone who has previously ordered either the HVR1 or HVR2 and wish to upgrade to the full sequence. 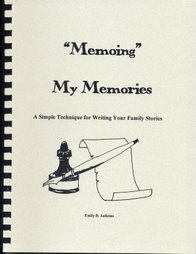 Please see the archives of this blog for information on using the full sequence for genealogy purposes before ordering. Email me at aulicino@hevanet.com if you have any questions. We are pleased to make a very special announcement about our Full Mitochondria Sequence test. As you know, this test has continually dropped in price from its initial introduction at $895 in 2005. These price decreases were related to volume and workflow, translating productivity into economies of scale that allowed us to reduce prices to those customers interested in testing their full mitochondrial sequence. Now Family Tree DNA is doing it again, but this time we are going to take advantage of new technology that will allow us to run more samples in less time, and the savings are substantial. We will jumpstart this new era of complete mtDNA testing with a very aggressive price in order to build the comparative database to the levels that genetic genealogists will be able to use to answer precise ancestral and geographic questions. Orders need to placed and paid for by the end of the day, October 31st, 2009. Depending upon the time that it takes to process these upgrade orders using our new hardware, we may experience a back order or lag time in November. If this occurs we expect to resolve the backlog in December. Genetic Genealogy, the use of DNA testing to aid traditional genealogical research, is the most accurate tool a genealogist has. it can prove or disprove a lineage, help genealogists pass through brick walls, assist in locating lost relatives, and aid an adopted person in finding family. Over the last nine years DNA Testing for genealogy has developed from one man's quest to find his ancestors to a world-wide interest for modern genealogists. That one man is Bennett Greenspan, a genealogist, who in 2000 established Family Tree DNA, the largest company focused on genetic genealogy. The company has remained in the forefront ever since. It offers the most genetic markers applicable to genealogy and has the largest database with which to compare a tester's results. This International business has expanded its offices to Europe, has participated in the 2009 Who Do You Think You Are? 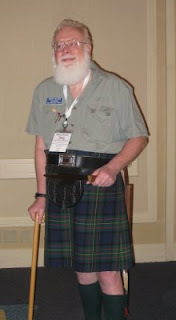 Conference, and was the only DNA company present at The Gathering 2009 in Edinburgh, Scotland. Since 2000 many other companies have been established with some now gone and new ones taking their places. In those short nine years, Genetic Genealogy has come a long way and is still progressing quickly! Geneticists and genealogists now work together in some realms of this science. The popularity of DNA testing is constantly increasing as more and more genealogists realize its value in their research. Why is Ireland a major focus? Since the seventeenth century Irish families have left Ireland for various reasons, including the Potato Famine, the opportunity of acquiring land not accessible under the inheritance laws at the time, and deportation by the English. Various sources state that Irish emigrants and their descendants are found in the United Kingdom, the United States, Canada, Australia, Argentina, New Zealand, Mexico, South Africa, Brazil, states of the Caribbean, and continental Europe. It is estimated that over 80 million Irish people live outside Ireland. This number represents over thirteen times the population of the island itself (6.11 million in 2007). This massive exodus has led many genealogists to long for knowledge of their ancestors who once lived in Ireland as well as the hope of finding living cousins. The men and women of our diaspora represent not simply a series of departures and loses. They remain, even while absent, a precious reflection of our own growth and change, a precious reminder of the many strands of identity which compose our story. Ireland obviously cares about its departed family. Descendants of the emigrants have proudly announced their Irish heritage for all these generations. Sadly, what is lost in time are the ancestors who connect the Irish throughout the world. With the vast numbers of these expatriates around the globe it is understandable why Irish Diasporas plays a prominent role in the focus on Ireland. Trinity College in Dublin is a pioneer in Irish genetics for using the old genealogies in genetic testing. In December 2005 Trinity published its paper on Niall Nóigiallach (Niall of the Nine Hostages) whose dynasty ruled Ireland for six centuries. Irish pedigrees were used to determine the surnames that could be related to descendants of the male lines of Niall which became the Clan O'Neill. Living males with surnames found in Clan O'Neill were located and tested. The study's findings suggested that about one in twelve men share the same Y-chromosome as the 5th-century warlord. Their work indicated that 21.5% of the men in Northwestern Ireland are estimated to have his DNA signature. Trinity College's study sparked an interest for Irish genealogists everywhere. For scientists to use genealogy and DNA testing to determine who among the living is related to a particular fifth-century clan was a major step in placing Ireland on the Genetic Genealogy map. In April 2005 the Genographic Project was created by the National Geographic Society, IBM, and the Waitt Foundation. This five-year anthropological study was established to test indigenous people throughout the world in order to better map the migration patterns of our most ancient ancestors. Anyone can submit their DNA to this project as ti is one of the few scientific studies that allows the general public to participate. As a result of this venture, many Genetic Genealogists established various geographical projects to provide a permanent place for the public's test results since at the end of this study, the results will be available, but the DNA Will be destroyed, thus not allowing an opportunity for anyone to upgrade their test in the future. The Ireland Y-DNA Project was created in December 2005 as its administrators saw the need to preserve the Irish DNA that the Genographic Project collects. The Y-DNA Project's roots lie in Ireland as two of the three administrators live there, thus providing the expertise needed to help Irish genealogists. This project is the largest Y-DNA project with over 3,300 testers, not including those from other companies which raise the number closer to 5,000. With the expert help of the administrators and the vast number of testers, the project results are revealing that some DNA signatures are more prominent in certain counties of Ireland. This provides a probable location for a researcher whose family left Ireland years ago to being their search in the mother land. The size of the Ireland Y-DNA Project is testimony to the inter st in the Emerald Isle. In genetic genealogy the Y-chromosome is used to test the all male line (top line of a pedigree chart with the tester as number one on that chart) as this chromosome is consistent over time. For this reason a living male can be tested to determine the DNA signature of his ancestors in his all male line. The same is true of sections of the mitochondrial (mtDNA) which tests a person's all female line (bottom line of the pedigree chart if the tester is number one on that chart). Men can test both their Ydna and their mtDNA as every mother passes her mtDNA to all her children. However, only the daughters can pass the mtDNA to her children. Women can only their their mtDNA, as naturally, they do not carry their father's Y-chromosome. As Ydna mutates (changes that do no harm the species) more often it is possible to determine matches between testers within genealogical time. The mtDNA is slower to mutate, thus common the common ancestor of testers who match is not always within genealogical time. Testing the mtDNA has been immensely useful in solving specific problems for genealogists. Refer to SUCCESS STORIES at www.isogg.org for examples. The next article in this series will focus on Irish DNA Success Stories. Will Genetic Genealogy Lose Its Place? Currently legislation is being passed that will curtail the use of DNA testing for genealogy and cause it to be more expensive. Some states have already passed laws controlling companies who market DNA tests to the public and more laws are being established. As this is a very important topic, I felt it is necessary to share an article written by Doris Wheeler with you so that everyone knows and understands how DNA testing may be jeopardized. Being that DNA testing is the most accurate tool a genealogist has, it is important that all of us understand the impact a few can have on many. There are geneticists that think genealogists do not understand genetics and that we believe everything any company claims (i.e., if you have a certain results for some markers you will get some disease or you can be a track star). There are many genealogists and genetic genealogists who believe that some geneticists as well as people from the medical field do not understand how DNA testing is helpful to genealogy. They wish to protect us from ourselves! As a result we are seeing government legislation trying to protect the poor, dumb consumer. RIGHT! This type of legislation will greatly harm the genealogist's access to DNA testing thus prohibiting an opportunity to break through their brick walls. Doris Wheeler addresses this topic clearly and urgest that all of us must become informed. I urge you to take action locally and not let misinformed scientists and legislators control our hobby. Write those editorials, call your legislators. Do what you can to protect the most valuable and accurate source we have for finding our ancestors. Thank you Doris, for permission to post your article. A small but vocal group of scientists and legislators are clamoring for government regulation of DNA testing. A few states have already succumbed to this hysteria, and Washington has dipped its toe into the murky waters. What does this mean to family genealogists like us? It could mean that we would have to have our family doctor submit an order for us to obtain a simple Y-DNA test. And the results would go to him or her. (Could there be a touch of self-interest on the part of the scientific and medical community?) As genealogists, how many of us would be willing to involve our personal doctor in our genealogy quest – and pay for the privilege? What does our family doctor know about genealogy, and does he care? Is he really the best qualified person to interpret results for us? Did you ever think you would have to get your family doctor to approve before you could do genealogy? It all sounds rather silly to me. One argument in favor of such regulation is that people do not understand what they are getting when they buy a test. But isn’t this true of many things? Isn’t it up to the consumer to research and understand what he is buying? Another is that there are claims being made by some companies that promise far more than they can deliver. But this is a fact of life. It is up to the consumer to evaluate these claims. Another service provided by FTDNA is its support for “projects.” All project members benefit from that support by having access to significantly reduced prices and special promotions that are only available through projects. Additionally, volunteer project administrators like me are provided with ongoing education so that we can better serve our clients. We seek to educate and to help explain test results so that our clients do understand what they are buying and why, and what the results mean. While the line between genetic genealogy and genome testing for health reasons is quite sharp, the naysayers are beginning to disregard that line and lump all genetic testing together. That is a sad day for genealogists who are just now beginning to reap the solid rewards of having databases that are large enough to provide answers to sticky questions. Ever larger databases of test results help all of us learn more about our family history and answer the age-old question, “Where do we come from?”. Any disruption of the flow of new testees is a disservice to those who have already tested and to the cause of genealogy for everyone. The jury is still out regarding the viability of genetic testing for disease. Obviously, again, the size of the database is critical and our knowledge will grow only as the database grows. And, in addition to all the reasons given above, there is the simple matter of personal choice that is taken away by increased regulation. Since the key is an educated public, here are two websites that are highly recommended: www.isogg.org and www.thegeneticgenealogist.com. WOW....FTDNA is offering a sale for the MONTH of July! Read the msg below I received today! Remember, a person must join a project to get these prices, but I have two that anyone can join (male or female) any time and then move to a more appropriate project (or not) at a later date at no cost. There's never any cost to move to different projects. We thank you for your continued support and look forward to the sustained growth of the Family Tree DNA matching database. Family Tree DNA Sale Extended! The following Family Tree DNA sale has been extended to Jun 30th with payment due by July 7th. This sale is only for new male testers getting the 37 marker with the HVR1 (mtDNA). The 37 marker test is wonderful for genealogy. The price is $119 plus $4 shipping. Usually the 37 marker alone is $149 plus shipping and the HVR1 is $99. So that is a very good savings. We may not see this sale again. FTDNA just sent this message to all the Administrators, so I'm passing it to you. You can pass the word around the Internet and within your family. We have decided, therefore, to extend it until June 30th, 2009. Kits must be paid by July 7, 2009. In order for the most people take advantage of this promotion, we encourage you to post the following link in your family messages boards, blogs, and mail lists, as well as forward to people when they ask you where to place the order. As always, that you for your continued support. I wanted all of you to get in on this before it's gone in the case you have been waiting for a DNA test sale. I just received this msg. from FTDNA.... It's a VERY nice sale as the 37 marker Ydna test by itself is normally $149. The mtDNA by itself is normally mtDNA (HVR1) $99. That's a nice savings! The deadline as stated below is June 24th and you MUST pay by June 30th. If you order by credit card it is considered paid. If you order on invoice be sure to send in your payment (Check or credit card is accepted with an invoice.) by June 30th. Just click on the FTDNA icon at the bottom right of this blog. Then follow the rest of the directions, putting in your surname or one of the above (GFO or WVGS). The rest of the steps are clear. I can order the test for you via invoice so you won't miss the sale. This is your new members’ opportunity to skip past the Y-DNA12 and Y-DNA25 tests and get the best Y-DNA Genealogical test on the market in addition to an mtDNA test for an extremely reduced price! So... I hope that with this promotion your project can gain many new members. Which DNA Testing Company Fits Your Needs? In the early years of 2000 there were only a few testing companies that tested DNA for genealogists. In the last few years, DNA Testing has become a household term, especially due to the advent of so many television programs using it to miraculously solve crimes within an hour. Many new companies have now appeared on the scene with a varying degree of services. Some have massive advertising campaigns that entice the public to purchase a testing kit even if the public does not fully understand how testing can help and not help genealogy. Others claim they can give you the location and tribe of your ancestors. And, still other companies claim you can discover the gene that will either make you an athlete or tell you of your health issues. News articles have touted the virtues of testing while others liken it to witchcraft and hocus-pocus. Some articles instill fear that the government will have your DNA profile and tag you for some crime. In some of my past articles, I have explained how different companies test differently for criminal profiling and for health. I have further explained how DNA testing can and cannot help genealogists and how autosomal testing is not helpful to genealogy for the most part. So, how does the general public sort out this mess? 1. Educate yourself about DNA testing. Before purchasing any test for any reason, the buyer must understand how DNA testing can help and how it cannot help. 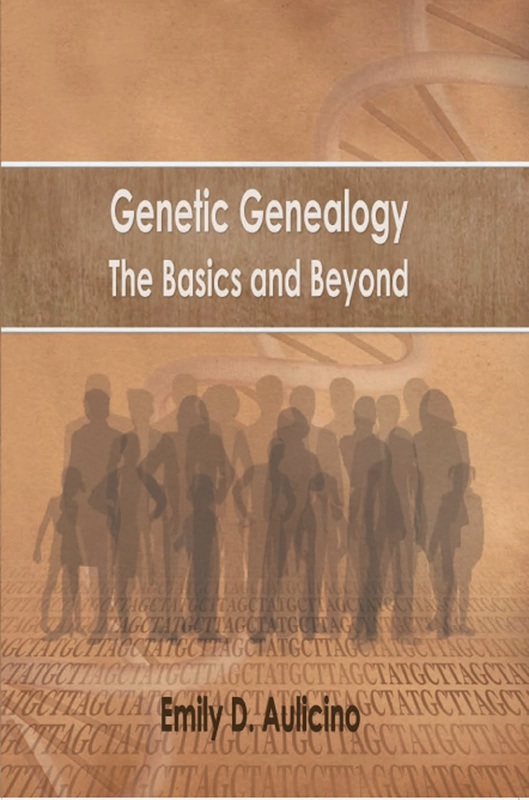 My previous blog articles can greatly help with this as well as the listing I offer for online tutorial information and through various Genetic Genealogy books. 2. Establish a goal or reason to test. 3. Learn all you can about the testing companies. You do not have to know everything about every company, but you should understand not only the difference between the three top companies, and which companies are not helpful to genealogy and your goals. 1. What is the size of the database? Size is important. You will be compared to other testers in order to find matches. You and those testers who match have a common ancestor. You would want to contact them and share lineage information. Would you wish to test with a company who has over 100,000 testers or one who has 10,000 testers? Which has the likelihood of producing more matches for you? 2. Can you contact the testers you match? Matching others, but not being able to share data on your research makes testing and matching a waste of time and money. 3. Can I contact the company easily? You may have a problem or a question. Some companies list no email or phone number to contact them. Some prefer that the administrator of a project contact them. (What if you are not in a project?) Others will answer your question within one business day whether it be by phone or email. 4. How accurate is the testing? No doubt every company will tell you their labs are accurate, and this has been found to be true for giving you your haplotype (your DNA signature). However, some companies will do testing to determine your haplogroup (your twig on the world family tree) while some do not do this testing, called SNP testing. The companies who do not SNP test do take guesses for the haplogroup and have been found to be totally in error. I can cite several cases of this. Unknowledgeable testers may not discover this error unless they test with another company or find that they do not match with a known relative for the haplogroup. 5. Will my DNA sample be stored so I can upgrade my testing? DNA testing for genealogy began in 2000 and is still evolving. We do not know what the future holds, but we know that more and more tests are available every year. Some companies do not keep your sample so you must pay for another kit to test further. This would be impossible for a tester’s family to do if the tester dies. Other companies keep the sample for many years and allow you to upgrade using the same sample. 6. What tests are available? Tests vary from company to company. Each company does not test the same markers; therefore, comparing someone who matches you from another company isn’t as easy as looking at the results and often doesn’t test enough of the same markers to get a clear picture of how close your match could be. Some companies only offer a few tests and appear to have no plans for changing that. Other companies offer a wide variety as well as combination tests (Ydna and mtDNA as one test for a person). Some companies are always adding new options to better serve their customers. a. 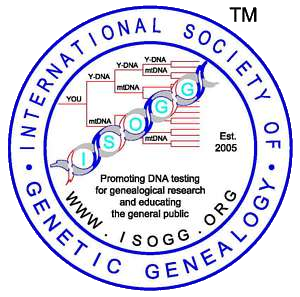 Join the International Society of Genetic Genealogy (ISOGG) at www.isogg.org and ask the other members about their experiences. This society is non-profit and requests that you tell others about genetic genealogy. 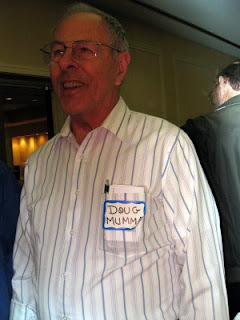 That is their only requirement … to help spread the word about DNA testing for genealogy. This email list is monitored by experts, but can be overwhelming in volume. Consider getting it in digest form or check it online. b. In some companies you can go to the website and find the administrator of any project. Email this person to see how the company is treating them. Other companies do not provide this service, however. c. Email me. I have friends who have dealt with all the major companies, and I have met testers who have used these companies. I can provide you with comments about each of the major companies from both testers and administrators. 8. What is the cost of the tests? Many of us are always looking for a bargain. However, the cost should be the last consideration as this is a product that can be very helpful to our genealogy research and is of great use over time. With it we can prove or disprove our lineages and find matches today or in ten years. A wise consumer will seek a reliable company which provides the best of the above points before placing cost as the top priority. Cost varies from company to company and will change within a company as sales are often available and as over time the prices are falling due to new techniques and equipment that requires less time in the lab to process. The best approach to this concern is to set your goal for testing, select the test that best fits your needs, and then compare the cost per marker for each company that fits your testing needs. Sales are usually unpredictable since you never know when one will happen. Some companies will allow you to test a few markers and upgrade any time later which helps you afford a larger test sections at a time. Family Tree DNA is having a sale to upgrade any Y-DNA tester at a nicely reduced price. As these sales are often rather rare, you may wish to take advantage. If you have questions as to why you should upgrade, please check the archives for this blog as there are articles on the advantages of testing particular numbers of markers and how they help genealogy. Over the last several years, due to the unmatched growth of our database, numerous people have confirmed and found new connections with others of their surname, and adoptees and descendants of adoptees have even found their biological surname lines. Are there any other individuals among these adoptees looking for their connection to this direct paternal line? To help answer that question, Family Tree DNA is offering, for a limited time, a discount on all Y-DNA upgrades! We will notify each participant in the database who qualifies for this offer by e-mail, and will provide them a direct link they may use to take advantage of the upgrade. There will be no need for participants to contact us directly in order to receive the reduced price; our prices have been adjusted in the system accordingly. reduced prices will be 25% lower than the standard upgrade price. This is a great opportunity to increase the data in your project. Are there members who have been hesitant to upgrade due to price? This discount is an opportunity for them to upgrade and help both their group and potential lost relatives at the same time. When encouraging members to upgrade, you may wish to note that genetic matches allow people to find their biological lines, and not necessarily a specific individual. This promotion is for upgrades only and does not apply to new kit orders. It’s our way to thank past customers for their patronage.